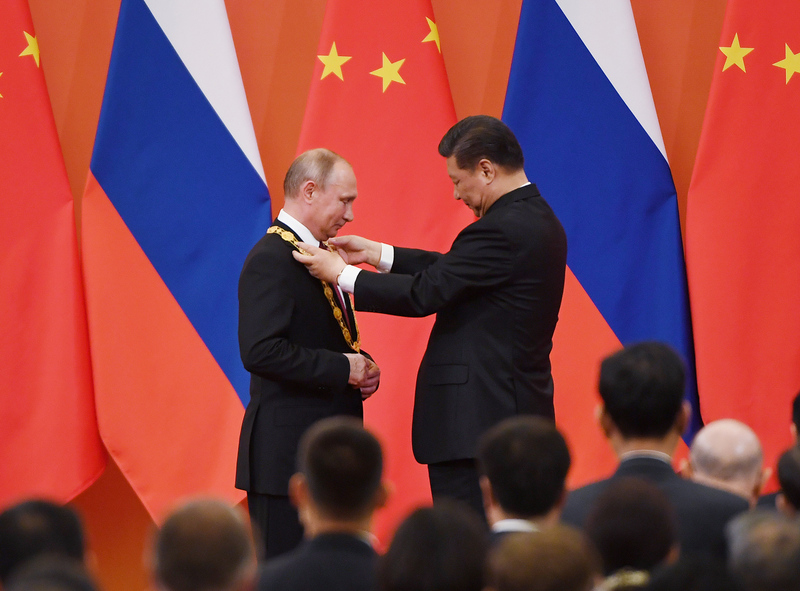 Chinese President Xi Jinping (right) presents Russian President Vladimir Putin with the Friendship Medal at the Great Hall of the People in Beijing, June 8, 2018. As U.S. relations with China and Russia deteriorate under the Trump administration, bilateral relations between Moscow and Beijing grow stronger. In this podcast, Paul Haenle spoke with Dmitri Trenin and Alexander Gabuev, Director of and Senior Fellow at the Carnegie Moscow Center, respectively, about dynamics between the three countries and whether U.S. policy is driving China and Russia closer together. Trenin says Russia’s foreign policy prioritizes protecting its sphere of influence, asserting its role as a great power, and standing up to external pressure and sanctions. With regard to China-Russia ties, Gabuev analyzes the pillars that have strengthened the relationship: stability on the shared border, political and economic compatibility, and a strong relationship between presidents Xi and Putin. Despite the divergent economic development paths of the two countries over the past 40 years, Gabuev and Trenin agree that economic asymmetries have not undercut the relationship. Trenin argues that Russian and Chinese interests are naturally aligned, but U.S. actions are helping to drive the two countries even closer together. Russia does not feel threatened by China’s rise; Moscow remains confident that it can still benefit from the relationship. A “Cold War” between the U.S. and China has not yet begun, Trenin and Gabuev agree, but the two sides are increasingly confrontational and risk shifting from competition to rivalry.